The meaning of processing a „data session“ is to applay the model on a set of trials called data session. As defined in the projects „job configuration“, the trials of the session are split into serveral groups of trials. A trial can be an element of more than one group. Trial by trial is processed, new timeseries and parameters are created and saved in a format as defined in the „projects labelset“ and „job configuration“. The default output model writes the output of the complete session into a single file with suffix „.d3d“. 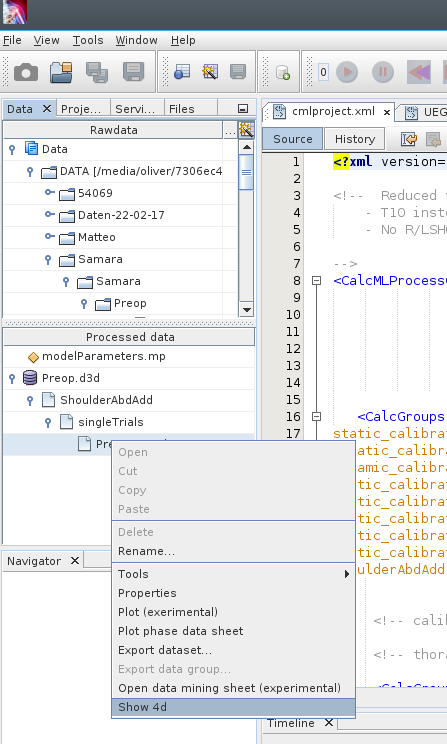 Other output formats and models are possible. To process a data session, right click on the sessions folder in the „Data Explorer“ to open the context menu. The „Process“-action processes the session without further questions based on the main projects. The action „Process…„ open a dialog, before processing, to select a model and/or to make a choice, which trial groups should be processed. For sessions with many long trials on a slow computer this can save time, if processed data is not needed for all trials. The next step in a typical workflow includes visualization of the processed data as a 3d-view and as a sheet of plots e.g. of joint angles. To do this open the tree of the output d3d-file, select a trial, open the context menu with a right-click and choose an action. Have a carefully look at the data, Sometimes you can see artefacts based on errors in the proprocessing of the data. Than you have to work on the rawdata with e.g. relabeling in the case of an markerbased system, setting of events, etc. and than you have to process the data again with the „Upperlimb“ software. It can happen that you work in one or more of these cyclces. If all is ok, than typcially you save the the data of the complete session by using the "saveAsMeanStd" action in the context menu of the Plot Sheet into a single d3d-file in the output-folder of your project. This way you collect the data from one or more sessions in a single folder as a database for further analyses.